A recent patient of ours reminded us of how common, yet potentially disabling this injury can be. “It was a seemingly small problem, but I underestimated how much trouble it turned out to be”, he said. And this echoes the sentiments of most patients with a mallet finger injury. An untreated or inadequately treated mallet finger can have significant negative impact on hand function. Mallet finger refers to the droop of the end joint where an extensor tendon has been cut or separated from the bone. Sometimes a piece of bone is pulled off (avulsion fracture) with the tendon, but the result is the same: an inability to actively straighten the fingertip. Mallet finger commonly occurs in athletic injuries, and basketball players for example, routinely experience ‘jammed’ fingers. This injury may also occur due to a crush injury of the fingers on the job, or when fingers are accidentally cut while working in the kitchen for example. It sometimes follows a relatively minor injury, for example stubbing the finger. In mallet finger, the tendon that straightens the fingertip is disrupted, the fingertip ‘drops down’ and the ability to straighten the finger is lost. A mallet finger deformity causing a fingertip droop and inability to extend the fingertip completely. 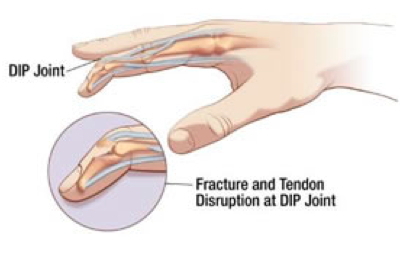 This is caused by injury to the extensor tendon over the distal finger joint. Early treatment should be sought for this problem. If ignored, the tip of the finger will catch on things (causing further injury) and the first joint in the finger may compensate by bending backwards (swan neck deformity). If the injury is old, or if treatment is delayed, there may be permanent deformity and loss of finger extension. The diagnosis is often easily recognised from the history of the problem and by examining the finger, as the fingertip has a typical posture. An X-ray is performed to demonstrate whether or not there is an associated avulsion fracture. The Mallet Splint immobilises the distal interphalangeal joint, bringing the 2 ends of the extensor tendon together and allowing it to heal, but allows movement of the proximal interphalangeal joint. Most mallet finger injuries can be treated without surgery, using a custom made splint that holds the tip of the finger in a straight position while the tendon or bone heals. Tendons heal slowly, and it is necessary to splint the finger for 6 to 8 weeks. At the end of the period of splinting, our hand therapists will initiate a simple exercise program to restore the movement of the fingertip, as initial temporary stiffness is expected after a period of immobilisation. Splints may require regular checks and adjustments by our hand therapist to ensure that they fit well and are effective. 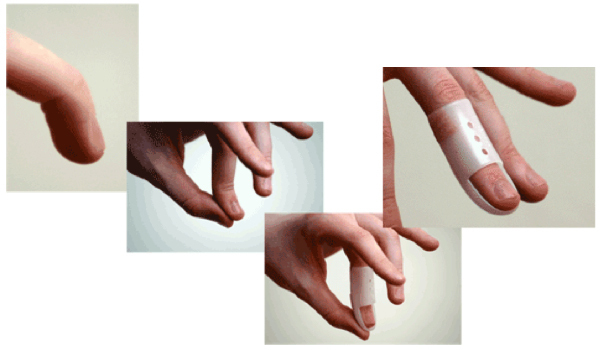 It is absolutely important that the splint be worn all the time during the first 6 to 8 weeks of treatment to ensure maximum effectiveness and permanent injury or deformity to the finger. If you do need to take it off (for example to wash) then you must keep that finger straight and not allow it to bend. This allows the two ends of the torn tendon or bone to stay together and heal. About 3 in 4 cases heal well with this treatment. Surgery may be required to repair the torn tendon if non-surgical treatment is unsuccessful in restoring the ability to extend the finger. Surgery may also be recommended immediately if there is an open wound. Mallet Finger injuries with large avulsion fractures are best treated with surgery. In cases where there is an avulsion fracture and the piece of bone is quite large (causing significant joint surface irregularity), surgery may be advised to reattach the bone fragment using a small screw or stiff wire (K-wire). Surgery may also be considered for patients who would be unable to work or would have significant difficulty if they had a splint on the finger; this includes patients who need to wash their hands frequently for example nurses or chefs and mothers with babies. The alternative treatment to a splint is a small operation where a fine stiff wire is passed across the finger joint to hold it in a straight position while the injury heals. The wire is buried under the skin at the tip of the finger, and removed at the end of the treatment. Insertion of the wire is a quick, minor operation performed under local anesthetics. If you clip your fingers while stacking chairs, or your finger gets hit by baseball or basketball end-on, or you twist the end of your finger while tucking in the bed-sheets remember it could be a mallet finger injury. If you’re unable to straighten your finger after the injury, seek expert medical advice early, to avoid disability and maximise the success of treatment. Teoh LC, Lee JYL J. Hand Surg (Br.) Feb 2007; 32(1): 24-30 Mallet Fractures: A novel approach to internal fixation using a hook plate.